Hyperion Books for Children, New York, 2010. 60 pages. I'm sure that everyone who reads my reviews regularly knows that I am a huge Mo Willems fan. It's gotten to the point that I resist reviewing his books -- because I think I may be getting tedious telling every parent and child I know to read Mo Willems' books. They're consistently brilliant, and how many times should I say that? So I try to only review the stand-outs among stand-outs. However, City Dog, Country Frog, is something new. It's a book written by Mo Willems, but illustrated by someone else. I've already reviewed Jon J Muth's book, Zen Shorts. The pictures in that book are beautiful, and the result is a quiet, meditative book. 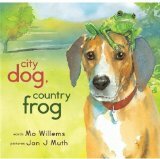 As big a fan as I am of Mo Willems, what blew me away about City Dog, Country Frog was not the words but the illustrations. (Though both components are definitely necessary and work together beautifully.) I'm already thinking that I hope this book gets some recognition from the Caldecott Award committee. On the opposite page, we see a country house with a big enormous spring-green lawn overshadowed by a tree with blossoms. City Dog is running fast down at the bottom corner of the picture, heading off the page, and printed on the picture around him are the words "and all without a leash!" When City Dog gets to a pond, he spots something he's never seen before, sitting on a rock. That Spring, the two new friends play together, and Country Frog teaches City Dog "Country Frog games." Country Frog's games involved jumping and splashing and croaking. When Summer comes, City Dog teaches Country Frog "City Dog games," involving sniffing and fetching and barking. I love the way the pictures show Country Frog throwing a stick and City Dog eagerly running to fetch it, but then they finish when "Country Frog was too tired to sniff and fetch and bark anymore." When Fall comes, Country Frog is tired, so they play "remember-ing games," remembering together all the fun they have had during City Dog's visits. In winter, "City Dog didn't stop to eat the snow; he ran straight for Country Frog's rock." But Country Frog isn't there. Finally, when Spring comes again, there's a nice full circle as a new creature sees City Dog sitting on a rock. My one warning to parents is that your child may ask where Country Frog went, and, as they said in Horn Book Magazine, "this is not a story about hibernation." But the story is so simple and so beautiful. City Dog appropriately remembers his good friend and passes on his legacy -- but doesn't stop living life now. As usual with Mo Willems books, there are profound truths behind this book, conveyed simply and so much more powerfully than the most eloquent sermon could ever do. But let me talk about the illustrations! The story is excellent, simple and profound. But the pictures carry the book into a true stand-out. Jon J Muth has done an amazing job with this book. His watercolor work is beautiful, there's no question about that. But he keeps the book from feeling heavy or sad or overly serious, with nice touches like City Dog's wagging tail and cartoon-like eagerness. So many of the paintings I just love and would happily frame and hang on a wall -- City Dog with his nose in the pond wagging his tail after the friends have been jumping and splashing and croaking; City Dog swimming with Country Frog riding on his nose; the sunlight shining on City Dog's back as he carries a stick on the section page for Spring; Country Frog flinging a stick and City Dog eagerly running to chase it, tail wagging; the glorious colors of Fall when City Dog arrives again in the country and rushes happily to Country Frog's rock; City Dog's ear lifted with curiosity when he arrives at the snow-covered rock in winter and looks for Country Frog; the glorious two-page spread of City Dog waiting for Country Frog on the rock in the purple and yellow winter twilight; but most especially City Dog's face when he meets a new friend and "smiled a froggy smile." Jon J Muth manages to make his face look just like Country Frog's face -- yet remain fully doggy. It's probably silly for me to try to describe all the wonderful pictures. This is a book you should check out and look at for yourself!